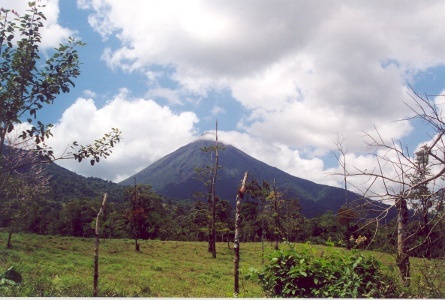 The Arenal Volcano in Costa Rica is a site of ongoing research. GPS and InSAR can be used to monitor volcano deformation. This is of great practical interest for hazard assessment, because volcanoes are thought to undergo significant inflation in the weeks or months prior to large eruptions (of course the data have to be available in a timely manner) [Dixon et al., 1993, 1995; Webb et al., 1995; Hagerty et al., 1997]. Volcano deformation is also of scientific interest, because the pattern and magnitude of surface displacement can be used to determine the depth, and in some cases the size and shape of the center of deformation, which may be related to the top of the magma chamber or a dike [Dixon et al., 1997; Mattioli et al., 1998; Newman et al., 2001, 2006; Walters and Amelung, 2005].